Launched earlier this year, the 30.2m motor yacht Aleica was recently delivered by Benetti Sail Division. Built in steel and aluminium, this slim tri-deck superyacht is characterised by a low-slung superstructure with large and continuous windows along the superstructure. The yacht originally had a layout of four cabins, but the client asked for another and, thanks to the flexibility of the Benetti Sail Division approach, the builder has been possible to find a proper space for a fifth cabin, all of them being located on the lower deck while crew quarters are forward on the main deck. A sober and refined décor and style was chosen, which is enhanced with the use of precious materials. Canaletto walnut has been used for the flooring and oak for the furniture, while all the bathrooms are clad in marble. Twin 1,000hp MAN engines give to Aleica a top speed of 14.5 knots, a cruising speed of 13.8 knots and a range of 4,900 nautical miles at 10 knots. 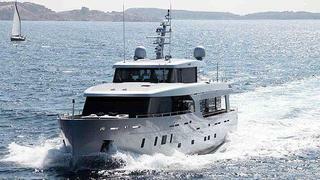 With Aleica delivered, Benetti Sail Division is actively working on a BSD 105 RS motor yacht to be delivered in 2014.